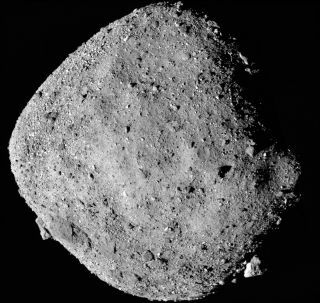 The near-Earth asteroid Bennu, as seen by NASA's OSIRIS-REx probe on Dec. 2, 2018. A NASA asteroid-sampling probe has begun circling its space-rock target, setting a new record for the smallest body ever orbited by a spacecraft. The OSIRIS-REx probe achieved orbit around the 1,640-foot-wide (500 meters) near-Earth asteroid Bennu with an eight-second engine burn today (Dec. 31) at 2:43 p.m. EST (1943 GMT). OSIRIS-REx officially arrived at Bennu on Dec. 3. For the last four weeks, mission team members have been taking the space rock's measure, nailing down the object's mass and mapping out its shape in great detail. Such work was required before attempting orbital insertion because "maneuvering around a small body that basically has no gravity is a very challenging endeavor," OSIRIS-REx Deputy Principal Investigator Heather Enos, also of the University of Arizona, told Space.com earlier this month. "So, we do have to get a little more information to proceed every step of the way." OSIRIS-REx also set a new mark today for the closest orbit of a small body. The probe is now circling about 1 mile (1.6 km) from Bennu's surface, mission team members said. The $800 million OSIRIS-REx mission — whose name stands for "Origins, Spectral Interpretation, Resource Identification, Security-Regolith Explorer" — launched in September 2016. Its main goal is to help researchers better understand the solar system's early days, and to shed light on the role that carbon-rich asteroids such as Bennu may have played in helping life get started on Earth (by delivering water and organic molecules to our planet long ago). "With the navigation campaign coming to an end, we are looking forward to the scientific mapping and sample site selection phase of the mission," Lauretta said. OSIRIS-REx's orbital insertion was the first of two big spaceflight events occurring within a span of mere hours. NASA's New Horizons spacecraft will zoom past the small object Ultima Thule at 12:33 a.m. EST (0533 GMT) Tuesday (Jan. 1), performing the most-distant planetary flyby in history. Ultima Thule is about 4 billion miles (6.4 billion km) from Earth — 1 billion miles (1.6 billion km) beyond Pluto, which New Horizons visited in July 2015. Editor's note: A previous version of this story incorrectly stated that the asteroid Ryugu had been the smallest celestial body ever orbited by a spacecraft. But Japan's Hayabusa2 probe has never entered a closed orbit around Ryugu. Mike Wall's book about the search for alien life, "Out There" (Grand Central Publishing, 2018; illustrated by Karl Tate) is out now. Follow him on Twitter @michaeldwall. Follow us @Spacedotcom or Facebook. Originally published on Space.com.